You can group together a certain melange of designers into the “intellectual fashion” camp. There’s Miuccia Prada’s eponymous label, Jonathan Anderson’s J.W. (and Loewe takeover), Jacquemus. Not to be forgotten is Cosuelo Castiglioni’s Marni. In the search for modern romance in her collection, Conseulo created another evocative body of work to tantalise the senses. A master colourist, her use of different hues was superb. Another testament to her talent is her ability to invent and obscure shapes. Proportionally some items were boundary pushing. While J.W. led the leg-o’-mutton revival, Consuelo is looking south to the forearm. There, sleeves are ballooned, rounded (in crisp white, or printed using brightly coloured Art Nouveau techniques). Furs jackets, sweaters and skirts featured rounded edges. The opening cape, in a subtle beige, could morph into an amazing evening look. One dress sat unpleasantly, but that was its charm. The red tank had billowing sleeves and a narrow skirt. Oddities like this are singular to Marni. Intellectualism doesn’t necessarily have to translate to oddness (in the case of Prada or Simone Rocha), but when it does it leaves a sour taste in your mouth—however, you don’t hate it. There was a mini dress with ruffled sleeves. Squiggle prints adorned the body. There was an empire waist, two buttons and bow details. Completed with a 40s hairstyle, a plum lip and knee high boots, there was a lot to digest. It was those looks, the ones you had to probe your mind to figure out whether you loved them or loathed them, that were the best. The excessive layering and dissonant colour choices provoked the best reactions. The more I delve deeper into the collection, the more I realise that Conseulo’s designs resemble art. The “fashion can never be art” dialogue is an interesting one, a topic for a later date, but the romantic expressionism through colour and shape make these looks more than fashion. They're sculptures unto which Consuelo has carved out sublime silhouettes, adding to them visually with multicoloured pailettes, printing, accenting. This was one of the more exciting offerings from Milan during the week. Excitement is what I look for in fashion shows. Feeling warm and fuzzy inside when debating a collection is an immediate sign for me that it’s a good one. (Even the bleakest of inspirations can provide a rush). Consuelo’s direction at Marni is unique. She doesn’t follow trends, she drives them. Expect to see rounded sleeves and Art Nouveau prints. 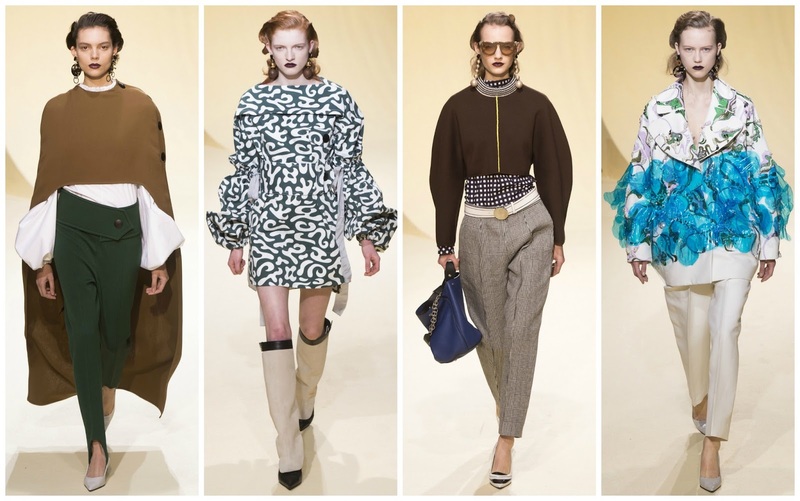 The other designers will want a piece of Marni. The customer, chiefly, is spoilt for choice.